In what order should we expect upper chamber seats to flip? To demonstrate just how Republican this year’s Senate playing field is, consider this: Of the 36 Senate elections this year (33 regularly scheduled and three specials), the Crystal Ball sees 16 as at least potentially competitive at the moment. Of those races, 14 are currently held by Democrats, and just two are held by Republicans. In other words, nearly all the competitive seats this cycle are in places where Democrats are playing defense. That fact alone indicates the GOP is poised for a strong cycle, although we’re not ready to say they will in fact win the six seats they need to take outright control of the Senate, even though they have a path to six — or perhaps even several seats more than that. Democrats, meanwhile, would do quite well to hold the GOP to a net gain of three or four seats. Such are the perils of holding the White House in a midterm election on the best GOP Senate map of the three classes contested once every six years. In this Senate update, we wanted to quickly sum up the state of play in all the competitive races, but also give a sense of which seats are likeliest to change party hands. 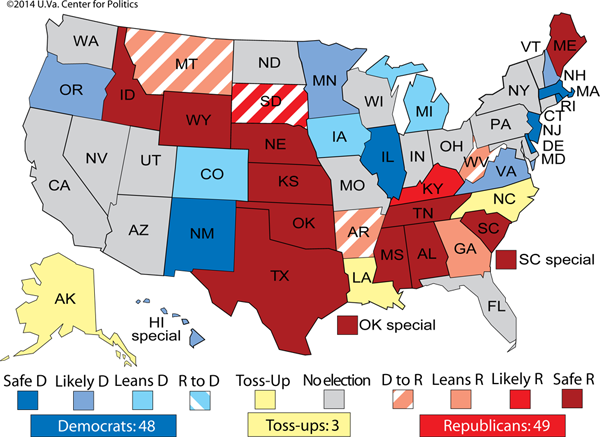 Our current ratings suggest that Republicans are at least slightly favored in four Democratic-held seats (Arkansas, Montana, South Dakota and West Virginia); have about even odds in another three (Alaska, Louisiana and North Carolina); and — stretching here — under near-perfect conditions could potentially compete in or even flip up to an additional seven seats beyond that (Colorado, Iowa, Michigan, Minnesota, New Hampshire, Oregon and Virginia). Meanwhile, Democrats have outside shots in Georgia, Kentucky and perhaps — if absolutely everything broke right for them — Mississippi. The following is our best guess as to how these dominoes would fall in November, ordered from likeliest to unlikeliest to flip parties. Let’s start with the long list of Democrats, followed by the Republicans, and then an overall ranking of all 16 competitive states. 1. South Dakota: Any path to victory for Rick Weiland (D), the Tom Daschle protégé who is running here to replace retiring Sen. Tim Johnson (D), probably involves former Republican Sen. Larry Pressler, an independent in this race, cutting into ex-Gov. Mike Rounds’ (R) GOP support. However, it seems just as likely that Pressler will end up drawing votes from Weiland. In any event, this pretty clearly has been and remains the easiest Republican pickup in the country. 2. West Virginia: Some Republicans fret about a massive Democratic registered-voter edge in the Mountain State as well as the notable fact that the GOP hasn’t won a Senate race here since the 1950s, even as the state has swung heavily Republican over the last four presidential elections. Republicans also worry that West Virginia, a small state with generally cheap media markets (with the exception of the eastern panhandle, which is covered by the pricey Washington, D.C. market), looks like some of the other low-population, cheap media states where they have frittered away winnable Senate races in recent years (like Montana and North Dakota). All that said, Rep. Shelley Moore Capito (R, WV-2) looks like the right person to break the GOP dry spell here, even as Secretary of State Natalie Tennant (D) mounts a credible defense of the retiring Sen. Jay Rockefeller’s (D) seat. We’re keeping this race in the Leans Republican column for now, but it’s much closer to moving to the Likely Republican column than to Toss-up. 3. Montana: With now-Ambassador Max Baucus headed to China, Gov. Steve Bullock (D) appointed John Walsh (D), his former lieutenant governor, to a Senate seat that Republicans have never held since the passage of the 17th Amendment. Our sources in Montana believe Walsh still has a lot to prove, and the new incumbent continues to have some primary trouble: John Bohlinger (D), ex-Gov. Brian Schweitzer’s (D) former lieutenant governor, is continuing his challenge to Walsh. Put it all together and Rep. Steve Daines (R, MT-AL), who should be fine in his primary, remains a favorite even though he is now running against an incumbent. 4. Arkansas: Sen. Mark Pryor (D) didn’t do himself any favors the other day by saying that his opponent, Rep. Tom Cotton (R, AR-4), has a “sense of entitlement” because of his military service. A mistake like this is often overrated, although it’s not helpful for Pryor, who is already an underdog in Red-trending Arkansas. It’s fair to wonder if Pryor, who basically got a free pass in 2008, is really in prime fighting shape, although Cotton’s fairly outspoken economic conservatism in a state that is more Mike Huckabee than Paul Ryan provides an opening to the incumbent. 5. North Carolina: The fifth slot on these rankings could just as easily be one of our two other Toss-ups (Alaska and Louisiana), but we’re going with Sen. Kay Hagan (D) as the most vulnerable of the three. Hagan’s approval ratings are poor according to several recent polls, and while she is a very strong fundraiser, Democrats have to be worried about her performance as a candidate. State House Speaker Thom Tillis (R) needs to improve his fundraising, though, and he hasn’t yet put away his primary competitors: Tea Party Sen. Mike Lee (R-UT) recently joined Sen. Rand Paul (R-KY) in endorsing physician Greg Brannon in the GOP primary, even though a jury recently found that Brannon had misled investors to a now-defunct technology company. Brannon or someone else other than Tillis could be a real problem for the GOP in the general election, though Tillis isn’t perfect either. 6. Alaska: Speaking of primaries, it’s been fascinating to watch the GOP contest in Alaska, where Lt. Gov. Mead Treadwell (R) started as the favorite but has been such a mess that the nomination is now former state Department of Natural Resources Commissioner Dan Sullivan’s (R) to lose. In fact, a couple Republican operatives separately told us that if Treadwell continues on in the primary, the distraction could cost Sullivan the seat. Also planning to run in the August primary is Joe Miller, the Republican nominee who lost to Sen. Lisa Murkowski’s (R) write-in campaign in 2010. GOP leaders aren’t worried about Miller winning the nomination, but a three-way race could further bog down Sullivan. Meanwhile, Sen. Mark Begich (D) is, we believe, a formidable incumbent whose biggest problem remains the Last Frontier’s significant Republican lean. 7. Louisiana: The likeliest outcome in this race is probably overtime: A couple minor Republican candidates could prevent Rep. Bill Cassidy (R, LA-6) from finishing ahead of Sen. Mary Landrieu (D) in the November election, but if he can hold her under 50% — and Landrieu is currently only polling in the low-to-mid 40s — there will be a December runoff that could potentially decide the Senate. It’s our feeling, and the belief of some of our Republican contacts, that this is the heaviest lift for the GOP in the seven states won by Mitt Romney in 2012 that are represented by Democrats on this year’s Senate map (those states are the ones listed one through seven on this list). 8. Michigan: Some characterize this race as a Toss-up, but we’re not there yet. Yes, former Secretary of State Terri Lynn Land (R) has performed admirably so far, and national Republicans in particular seem to be pleasantly surprised after they unsuccessfully tried to get other candidates to enter. But Democrats (and even a Republican or two) argue that Land has run a sheltered race and that she will be exposed as a poor candidate, to the benefit of Rep. Gary Peters (D, MI-14). Michigan’s Democratic tilt in federal races is a factor, too — though in the right year (such as 1994) it can be overcome. 9. Iowa: We get the sense that national Republicans favor state Sen. Joni Ernst (R), who was recently endorsed by Mitt Romney, to be their nominee here. However, Ernst hasn’t raised a ton of money and might have trouble winning the nomination. Mark Jacobs (R), a wealthy businessman who might also turn out to be a decent general election candidate, probably stands out with Ernst as the other top contender. If no one breaks 35% in a primary, anything could happen in an ensuing convention, including the nomination of a candidate ill-equipped to seriously challenge Rep. Bruce Braley (D, IA-1). With the right GOP nominee, this race could be a better Republican target than Michigan; with the wrong one, national Republicans might just write it off. One candidate we hear could be well positioned at a GOP convention is Sam Clovis, a radio host and college professor. 10. Colorado: After the entrance of Rep. Cory Gardner (R, CO-4), we moved this race from Likely Democratic to Leans Democratic. But despite Gardner stepping up against Sen. Mark Udall (D), the incumbent is a strong candidate with a golden last name. This race is more competitive than it was, but it — like Iowa and Michigan — is not a Toss-up as of yet. 11. New Hampshire: Simply put: If the Granite State Hamlet (former Republican Sen. Scott Brown of Massachusetts) gets in this race, it moves up this list. If he doesn’t, it moves down. Sen. Jeanne Shaheen (D) would remain the starting favorite in any event, but a Brown candidacy would be a late development even more significant than Gardner’s entry in Colorado. 12. Minnesota: Given his narrow win in 2008, Sen. Al Franken (D) should probably be more vulnerable than he is, although Republicans hope that businessman Mike McFadden (R) could make a run at him. It’s not obvious, though, that McFadden will get through the GOP primary; state Sen. Julianne Ortman (R) beat him in a recent straw poll. 13. Virginia: Former Republican National Committee Chairman Ed Gillespie’s (R) respectable but long-shot challenge to Sen. Mark Warner (D) could benefit if some of the other races listed above fizzle for Republicans: The party has an embarrassment of riches in terms of targets, but national dollars might more readily flow here if Republican challenges in states like Iowa, New Hampshire and Minnesota don’t materialize. Then again, the proliferation of outside money groups on the GOP side might end up providing more than enough money to fund a baker’s dozen races — and Gillespie should be able to raise a decent amount on his own. Warner remains very formidable, and if he somehow loses, it won’t be because he didn’t have the cash to compete. 14. Oregon: A credible GOP challenge to Sen. Jeff Merkley (D) may never actually materialize, in part because it’s not a sure thing that Monica Wehby (R), a physician who is the candidate Republicans talk up the most here, will advance from her primary. One other reason to doubt Republican hopes here, Democrats say, is a formidable Democratic ground game that maximizes the state’s mail balloting, and the turnout drops between midterms and general elections in Oregon aren’t as severe as they are in some other places (which is to the Democrats’ benefit). All others: One could make the case that Hawaii could be a long-shot Republican target, but that would depend on a devastatingly divisive Democratic primary between Sen. Brian Schatz (D) and Rep. Colleen Hanabusa (D, HI-1). The other Democratic seats are safe even in a wave scenario. 2. Kentucky: Senate Minority Leader Mitch McConnell (R) suffered another stumble in his awkward dance with the Tea Party during the Conservative Political Action Conference last week, when he brandished a gun on stage, prompting multiple comparisons to Michael Dukakis’s 1988 tank ride. So it goes with McConnell, who is exactly the kind of insider that insurgent Republicans dislike. That said, there’s little indication that McConnell is in much danger against primary challenger Matt Bevin (R). A general election contest against Secretary of State Alison Lundergan Grimes (D) won’t be easy, but we continue to believe the overall environment ultimately favors McConnell, even if he suffers from poor approval ratings. Republicans believe that McConnell, who is running about even with Grimes, is at his lowest possible point, and that he’ll pick up lost Republican support after the primary. Democrats hope that McConnell’s position is terminal. We have been bullish on McConnell for awhile now and continue to hold firm on our Likely Republican rating of his race, but if his numbers don’t improve in the summertime, he may be in for a downgrade. All others: Democrats got a rare bit of good Senate news recently when ex-Rep. Travis Childers (D) entered the Mississippi race. We’re keeping the rating here at Safe Republican, but if Sen. Thad Cochran (R) somehow loses the primary and if state Sen. Chris McDaniel (R) makes serious mistakes as a general election nominee then maybe the race becomes competitive. At this point, every incumbent Republican senator is favored for re-nomination despite a spate of noteworthy primary challenges to incumbents. Even if there are upsets, Childers seems like the only Democratic nominee who could capitalize in a general election. 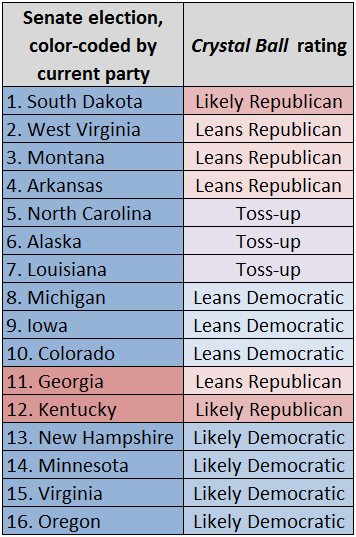 Table 1 below puts these 16 races in order of how likely we think they are to flip parties. So the 10 races we judge likeliest to change parties in November are all currently held by Democrats. Obviously, a lot can and will change. Democrats have to hope that Republicans continue their multiple-cycle trend of blowing winnable races by nominating bad candidates: The likeliest places for that to happen are Georgia, Iowa and North Carolina. Any improvement in President Obama’s approval rating would also help, and it remains interesting that despite the president’s weak numbers, Democrats are typically tied or slightly ahead on most generic ballot surveys measuring voter preferences in the House, which can also reflect the national sentiment in Senate races. That might end up being thin gruel for many Democrats, particularly Senate candidates and incumbents in Red states, but it could also lead to an election that is less about a big wave and more about certain Republican-leaning states aligning their senators with their presidential preference. That’s a dynamic we’ve seen in the House, where the number of Democrats representing Republican districts, and vice versa, has declined significantly. If that’s all that happens in 2014, Republicans trumpeting the election as a mandate-making wave will do so at their own peril for 2016’s more substantial, higher-turnout, across-the-map national battle.